A Kurdish fighter on a frontline in Kirkuk province, northern Iraq, is 300 metres away from an Islamic State position. The flag of Kurdistan is behind him. The United Nations Security Council today expressed concern over the “potentially destabilizing impact” of the Kurdistan Regional Government’s plans to unilaterally hold a referendum next week. In a statement issued to the press, members of the Council noted that the planned referendum is scheduled to be held while operations to counter Islamic State of Iraq and the Levant (ISIL/Da’esh) – in which Kurdish forces have played a critical role – are ongoing. The referendum “could detract from efforts to ensure the safe, voluntary return of over three million refugees and internally displaced persons,” the 15-member body added. Secretary-General António Guterres earlier this week voiced similar concerns about the timing of the vote in a statement issued by his Spokesman, which noted that all outstanding issues between the federal Government and the Kurdistan Regional Government should be resolved through structured dialogue and constructive compromise. 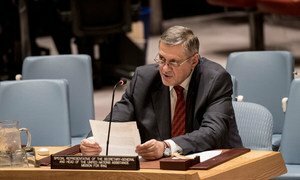 With the liberation of Mosul imminent, the international community must maintain a dual focus on defeating the remaining Islamic State in Iraq and the Levant (ISIL/Da'esh) forces in Iraq, and on working towards post-conflict security and reconstruction, the United Nations envoy for the country told the Security Council today.